They are meant to cross our path for a reason. Last week, July 12th to July 14th, I attended the Apraxia Kids National Conference in Charlotte, North Carolina. There were over 200 new attendees and this was the third largest conference the organization hosted. This was only my second conference attending, which still makes me a newbie. My first time attending was last year in San Diego, where I was a speaker with my Mom and also an up-and-coming Apraxia Blogger. This year, I was a Board Member with Apraxia Kids and a more well-known Advocate and Blogger. To say my roles changed drastically over the course of 1 year is an understatement. Also, if you make it through the end of this post, seriously congratulations because this may be my longest post yet! Yet, this is the best way to travel back with me to such a wonderful conference in Charlotte, the Queen City. I arrived for the conference late Wednesday night, the second I entered the hotel there was an immediate energy. I saw 3 people I knew as I walked between the entry door and the check-in counter. I said hello to Gary and Monique Fernando, and their presence was a relief. It's always nice to see familiar faces. We discussed how it's their kids-free weekend and also our Board Meeting tomorrow that Gary and I would attend. It was nice to know I wasn't going to be the only new board member. I also saw Nancy, an SLP who I had the pleasure of sitting next to on the Southwest plane from Dallas to Charlotte. Funny, we also were hotel neighbors and constantly joked about how we were not following each other. I was excited to get a good night sleep, but of course that didn't happen. I had a major case of insomnia that night. It also didn't help I accidentally consumed caffeinated tea in bed, thus I only slept for maybe 3 hours. Despite what little sleep that night, the next day was going to be a full, busy day. The eagerness and anxiousness would keep me alert thankfully. Little known fact, before the conference the Board of Directors have an all day, face-to-face meeting from 8AM to 3PM. All other meetings prior to this are phone conferences.This was the first time I saw anyone in person on the Board. It was also the first time one could truly express themselves with hand gestures, writing, and drawing. All members involved bring their unique perspective: different occupations, being parents, SLPs, a former child with Apraxia, and various opinions, but we all have the same goal- to help the organization and the families involved. For me, with every topic that arose I noted in tiny writing "What would help my friends?" and recall back on conversations I had with families through this blog, events, etc. That definitely kept me focused, so thank you for keeping me up-to-date on your own journeys! Anyways the meeting was long, but fruitful and being the only person in that room that had the disorder was intimidating and rewarding. After the meeting and quite a few coffees, I took a 20 minute power nap, got ready, and went down to the Reception. I saw familiar faces, like Lisa Klein (seriously, one of the coolest Speech Pathologists I've ever met!) and her awesome clan! People were using their Drink Coupons and playing Ice Breaker Bingo, where you'd find people and ask their favorite quote, if it was their first time, and find staff/board members in order to fill out your card. I met with several parents, talked about their travel and if they were new attendees or not. I caught up with an old friend, Jennifer, who was so dedicated and dyed her hair blue for the conference too! Parents showed me photos of their little ones and shared a bit of their journeys. I even had the pleasure of meeting with two Moms, Katie and Miranda, who were extremely excited to be there! Of course, we snagged a selfie too! Before you know it, we were off to the opening session. Angela Grimm, the new director of Apraxia Kids, took the stage and introduced the staff, board, and the leadership of Apraxia Kids. Just last year, Sharon Gretz -the original founder-was there, but seeing Angela now merely symbolized the change the non-profit is going through. I know I'm still relatively new, but even I can sense the growth, the sudden transition, and the future of this organization. Best of all, the feeling that I am just a part of this transition excited me. 2. (A minor point, but still powerful to me) Knowing the cause of Apraxia, whether genetic or not, does not change the treatment of it. Regardless, Speech Therapy is the best course for all. Soon after, the Staff and the Board all met for dinner and this too was the first time we all truly got to know and talk to each other. I didn't know all the staff members, but this was an opportunity to put a name to a face. I spent a lot of time conversing with Earnie Sotirokos and Kara Bayer. The conversations touched on some Apraxia points, like social media trends especially with Kara, and the not-so-serious points, such as, 90s playlists and my favorite music group Postmodern Jukebox. Look them up, seriously! After dinner and the most delicious sweet potato tots in my life, Ruth Stoekel, Lincoln Purdy, and I walked back to the hotel. It was humid, but nothing can beat those beautiful southern nights. I thought it was remarkable that, there we were, a professional SLP, a father, and a girl with a funny accent walking back in a group like old friends. Anyways, at the hotel, I saw the elevators and knew sleep was just footsteps away. Just kidding, I ran into more people I knew! Dave Hammer, Jeff Mills, and Josh Zellers were headed to this rooftop bar and I was curious. I had overheard how fantastic this rooftop bar was and I needed to go. Telling myself I was still a newbie and needed to continue meeting people, I was going on the principle of good networking. At the rooftop bar, we all ordered our drinks. We stepped out onto the balcony to observe the skyline and find a seat. Dave Hammer and I were immediately talking to other SLP's and I met a new parent, Meghan. She shared with me all about her son, who struggles with R-sounds, yet can sing Frank Sinatra beautifully. She also shared with me that she discovered her past academic records and reports indicating that she too had a speech issue, quite likely Apraxia, growing up as well. For her, Apraxia is a family thing. I looked at my watch, it was 11:30pm and I knew tomorrow was going to be just as busy. I said my goodbyes and off to bed. Day 2: How much makeup does it take to hide the bags under my eyes? Breakfast was at 7am, but if I wanted anything close to 'me time' and work off that bloated/post-cocktail feeling-I needed to go to the gym. I went to the gym at 6:30 in the morning, worked out a little and as I headed back to my room I ran into more Apraxia Conference Attendees. I really should've brushed my hair, whoops! After getting decently ready, I went down for food at 7:30AM to snag coffee, food, and ask others how they were holding up. That's when I learned I'm a terrible party animal at the young age of 24. I caught up with Angela Grimm, who cracked a joke and we lamented the fact we did not talk as much as we wanted to each other at dinner the other night. I also talked to a few other SLPs, like Michele who I met at the rooftop bar, but many were very excited to get to the first session. As soon as others went to the first session though, I went back to my hotel room. Now, before you give me a hard time, hear me out: I was meeting with Evan and Austin who were filming and interviewing for a documentary about Apraxia. It's for a Masters Thesis Project specifically, but who knows what it may turn into down the road. I ironed out my outfit, straightened my hair, drowned my face in make up, which you can't even tell on the cameras. I looked up the humidity level and decided to put on extra deodorant and hair spray everything-even my face. Fun fact: If you want your make up to hold and not melt or smear in heat/humidity-hair spray it. 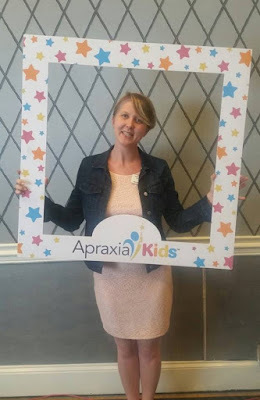 I was ubering over to meet them at a local hotel for the interview; excited to help out but even more excited to meet someone my age that had Apraxia. Indeed, Evan had Apraxia of Speech and you can't even tell today he had the speech disorder. The interview went well and I was nothing but honest in my responses. Austin handled the camera, inches away from my face and reiterated not to look into the camera [Oh, the irony]. Evan handled the interview questions and audio. Interview went smoothly for the most part. I felt that I was babbling, but being put on the spot and seeing 10+ pages of your blog printed out with questions next to each paragraph would intimidate anyone. What did I possibly put online? They asked about various Apraxia-related questions: my diagnosis, bullies, accomplishments, etc. At one point, I even referenced to my Mom's point that was hard for her and any parent- the fact that when a parent receives a diagnosis, they quit dreaming for their child's future. Exactly what they SHOULD NOT do. Twenty minutes in though, we realized the audio file was corrupted and we had to start the whole interview over. Austin remarked, "That was great content!" Despite the frustration, Evan and Austin maintained their calmness and tried to hide their clear agitation. I was laughing. Frankly, I have really bad luck. Knowing this has never happened to their audio files before me, I figured it was just my luck. Between chuckles I said, "Well, that was a practice round!" We re-did the interview, it was just as genuine before and we were off to B-Rolling. I now know what that means, basically it's taking live action shots of doing random things. They filmed me typing intently on my blog, walking up and down a street, up and down stairs, holding and adjusting my hands, and my personal favorite was walking up and down a hallway while not looking at the camera: looking pensive, and then looking fiercely confident into the camera, etc. It was very fun filming, but I was thankful for the air-conditioning after. I could feel the heat between my make-up and the hair spray on my face, but no one else could tell. The magic of make up, right? Later that evening, my best friend from college, Michelle, came in for the weekend and I changed into casual clothes as quickly as possible! We later found ourselves at the rooftop bar that evening for drinks and socializing. The place was swamped with Apraxia Conference Attendees, which was great but I never even stepped foot outside onto the balcony area! It was hard to walk around actually! Evan and Austin from earlier were also there, which was great. We talked about favorite presidents, Taylor Swift, and Michelle's recent trip to Mexico. In the midst of catching with Evan, Austin, and Michelle, I ran into my good friends and bloggers Laura Smith with SLP Mommy of Apraxia and Michelle Leigh with Apraxia Momma Bear . It was different seeing them this time at this conference, see last year they were the #1 bloggers for Apraxia. I saw them as the dynamic duo of Apraxia Advocacy and Blogging. This year though, I felt that duo become a trio. I felt all of our purposes and blogs were known. The fact we could now not only meet as bloggers, but also as friends on a rooftop bar was phenomenal. Now I was all over the place today and, as you read, I didn't attend any of the sessions. Thankfully though, I was able to ask around as to what people liked and didn't like. This way I was able to ensure and comfort an attendee that they could change their schedule around for tomorrow if they wanted to. This is where I felt that I was the most helpful was talking one-on-one with attendees to make sure their experience was all they wanted. Every few minutes, I was jumping between being a friend, a blogger, an advocate, and a board member within seconds of each conversation.It's enough to make anyone's head spin, but it was fun nonetheless! Oh,I even got to say hello again to my new friends Miranda and Katie! Last official day of the conference and I finally clocked in 5+ hours of sleep. I've never been so happy, but the fact I'd never catch up on my lost sleep was a reality settling in with the bags under my eyes. More make up anyone? More coffee, please? I went down at 7:30AM for coffee and breakfast. I stood in line for the bagels and began to converse with a lovely woman named Kim. We talked about her daughter, her daughter's diagnosis, and where the family was from. She asked me if I was a parent as well and noticed I was on the board with my name tag. I responded, "Well, actually I was diagnosed with Apraxia when I was a kid. Now I blog a lot about it and now serve on the Board." The pace of the conversation completely changed. There were more emotions involved, for the both of us. We were both nearly in tears talking about how there's little known about the future for kids with Apraxia and how important it is to maintain 'Hope.' Sure, there's parents, SLP's and Google-but who can show and deliver hope, comfort, and just actual proof it will all be okay? We exchanged contact information and she was off to the first session of the day. I ran back up to my room to actually put make up on, caught some of the soccer game with Michelle for an hour or so, and then back to work with Justin. Justin is on staff with Apraxia Kids primarily for fundraising. He was the first staff member I ever worked with back in college when I put together an Atlanta Walk for Apraxia for my 21st Birthday. If you ever get involved with fundraising, I assure you will work with Justin and he'll calmly talk to you when you're crying about walk venue options [I speak from experience]. Anyways, at the conference, he had a small group of videographers and was briefly interviewing a variety of people regarding the organization, Apraxia Kids. I was interviewed and as much as I'd love to say more, I'm also respectful of any potential confidentiality. I can say that I was honest and candid in my responses, genuine as always, and inwardly eager to see if England would win the soccer game. Left to Right: Emilee Purdee, Me, Aram Holland. An All-Female Apraxia Squad <-you read that right. As soon as I was out of that mini-project, I was out in the hallway with the crowd of attendees that were exiting the previous session and eager to eat lunch. I had gotten word that Aram Holland and her mother, Sharron Holland, were at the speaker's lunch with Mary Sturm. The Hollands were eager to meet me, as I was eager to meet them, but we kept missing each other! I was invited to join them for lunch by one of the staff members and bolted across the entire hotel to where the luncheon was taking place to meet with Mary, Aram and Sharron. I sat myself down at their table, which in hindsight is slightly rude of me, but they welcomed me with open arms regardless and we all introduced each other. I had met Mary already at the last conference and in the Board meeting, she's an absolutely fantastic woman. Whenever I have a board question or an "I'm confused" question, she's the first one to answer me. Now, Aram and Sharron Holland were a mother-daughter team presenting at the next session after the lunch. We shared some speaking tips, while also talking about self-esteem with Apraxia between boys and girls, and even favorite books too. Aram is currently reading City of Ashes, which she highly recommends. Lunch was quickly finished, we were off to their conference room for their session. I arrived at their conference room first and put on the OneRepublic Pandora Station to calm down any jitters. Aram and Sharron arrived right after me. The two set up their presentation with the intention to give hope to fellow parents as a Parent and Child overcoming Apraxia and all of its setbacks. I stayed for a good portion of it, but standing in the back. I noticed people funneling in and out, and wanted them to get a good seat as Sharron and Aram showed old photos, videos, and their personal journey with the crowd. At the end of the afternoon sessions, the conference was complete. Some meandered and continued to socialize; others bolted out of there to start heading home. Fortunately, I had an extra night in Charlotte as my flight was the next day. I talked a little more with Michelle Leigh from Apraxia Momma Bear and, as always, it was a great conversation from Sensory Processing Disorder to 401ks (not kidding!). I also met with Emilee Purdy, Lincoln Purdy, Nancy Purdy sharing our last exchanges. I heard so many great things about the Purdy family from Lincoln back in San Diego, but this year meeting the whole gang in person was amazing. I felt that I had known them for ages! We also talked with Josh Zeller from the Board and in true obnoxious, Aly-fashion we snagged a selfie before saying our goodbyes. As soon as I was headed out, I had one last exchange with Tamar Blazer. We had conversed over social media, but never in person so it was impeccable timing to run into each other at the last few moments! Tamar is a dedicated mother of twins, Apraxia advocate, and a very dedicated blogger! Check out her work here, you won't regret it! We were able to hug, discuss our travel woes, and promise to stay in touch in the future. We even snapped a selfie before parting ways. I went into Charlotte knowing or trying to understand my responsibilities over the week. I expected to meet new people, attend a few sessions [I wish I attended a bit more], and reconnect with old friends. 1. Balancing between being a blogger, advocate, and board member was a constant battle. One conversation I was a blogger then the next minute I was a board member. Then back to being an advocate. 2. Focus on the fact that everyone is there for one reason-the kids and the future. 3. Sleep is important, but I'd have more time in the day if I didn't need it! It is very nice of you to share your understanding. I have learned interesting things.